For several years I have held Passover dinners with friends and family. I have mostly held a more traditional Jewish feast, with very few changes to the Hagadah text (the traditional Jewish text used at all Passover feasts). However, this year I wanted to try something different. I wanted to create a setting that may have been closer to what Jesus and his disciples would have had. To do this I decided to have everyone sit on the floor around tricliniums, while eating with their hands and reclining on their sides (if they chose to). I must say it was probably one of the more memorable Passovers I have had. Below are a few of the pictures from the evening, including the table setup and the actual dinner. To create the short triclinium tables, I set each 8' table on two cucumber boxes (I got the boxes from my local grocery store). I bought baskets, wood bowels, and striped sheets from Goodwill. 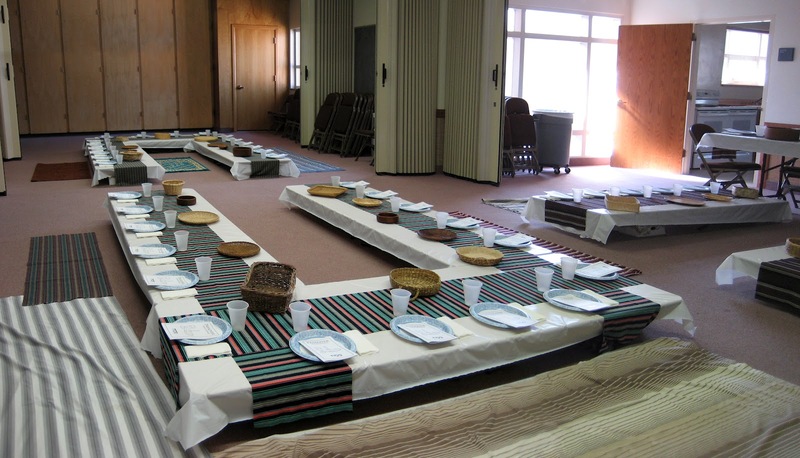 The baskets were used to serve food, and the sheets acted as a kind of mat for people to sit on during the meal. The table runners for the tricliniums were cut from long sheets (also bought at Goodwill) into pieces about 14" wide and 8-10' long. I did use plates (as it can be very hard to always be passing the main dishes around), but only had utensils available on a side table. As part of the feast, I had two from each table (who were sitting on the far end, nearest the kitchen) serve during the feast. They poured the grape juice, and also were responsible for assisting with washing the hands (one having a basin of water, the other a towel) as part of the Passover. These were our "servants" for the night. Each table could seat 16 comfortably, however, we could have squeezed in a few more. The head (or host) of the table was on the opposite side of where the servants sat (see my video about the setting of a triclinium). 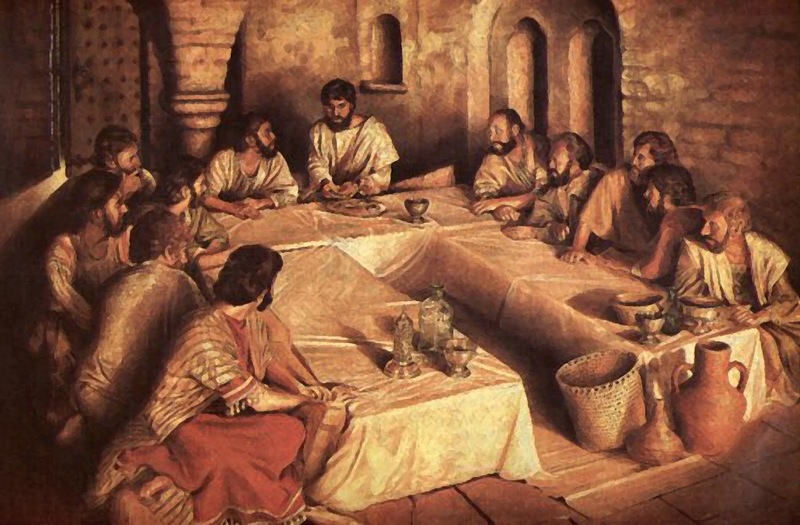 The head (second from the end) was served first, and acted as the leader during the Passover feast. He or she was also served the wine (grape juice) first, and had their hands washed first by the servants. Some of the food included entire fish (which was very popular), chicken strips, meatballs, shish kabobs, lentils, and many finger foods (including traditional Roman dipping sauces, grapes, plumbs, dates, olives, nuts, hard boiled eggs, etc). The unleavened bread and sliced apples, cucumbers, and peaches were used as a sort of utensil for the meal. Overall, I think it was a very unique experience. I hope to have many more Triclinium Passovers in the future. I will also try to share more details on how to host your own Triclinium Passover. L'chaim! (meaning "to life" in Hebrew).